The Archbishop’s Christmas Gala for Children, a Philadelphia tradition dating back 63 years, definitely had a different accent this year. That would be a Spanish accent. In keeping with this year’s Latin American theme and the tradition of Las Posadas, the commemoration of the journey of Jose and Maria from Nazaret to Belen, this journey began outside of the Archdiocesan Pastoral Center in center city Philadelphia where there was a Christmas pageant featuring students from St. Raymond of Penafort School and a number of live animals that may or may not have been found in ancient Palestine. After a greeting and blessing from Arzobispo Carlos Chaput (aka Archbishop Charles Chaput) the caravan of ninos and ninas made the arduous trek across 17th street to the Philadelphia 201 Hotel for the Gala. All of the more than 550 children received an appropriate straw sombrero and the fun began, featuring the multi-talented Padre Cristobal Walsh (aka Father Christopher Walsh) as emcee. Assisting with the entertainment were students from St. Raymond of Penafort School and St. Athanasius School with various skits and lively musical interludes which literally had the young guests spontaneously dancing in the aisles. Also contributing to the festivities were students from St. Charles Borromeo Seminary as well as students from Catholic high schools. 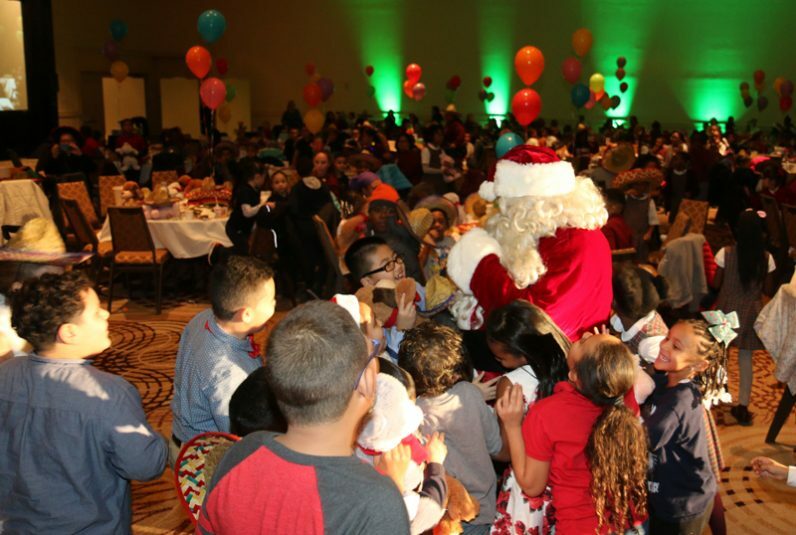 Attending as guests of honor were young children from various schools, residential programs, out-of-school-time programs and refugee programs from throughout the archdiocese served by Catholic Social Services. On hand too were the archdiocesan officials who work in the ministry year-round and adult donors who make the work of Catholic Social Services possible. Delaney cited the contribution of the many individuals and groups who work to make the annual event, which is also a fundraiser for CSS, a success. This year she especially cited Beneficial Bank, which has a long history of working with the church, as the main sponsor of the Gala. All of the archdiocesan officials present agreed it was a fabulous event, but the most important critics were the young guests themselves. Julia, one of the Little Bears from Casa Del Carmen, really liked the doll she received from Santa, and of the animals at the outdoor creche. She was awed by “the big one,” presumably the camel. As much as the young guests enjoyed the party, which could aptly be called a fiesta, the young volunteers were equally thrilled. Eric Tamney, a first theology seminarian at St. Charles, sported an impressive black sombrero, which could have passed for a black galero worn by a minor Vatican functionary. He is an old hand at the annual children’s party from his days as a volunteer while attending Bishop Shanahan High School.